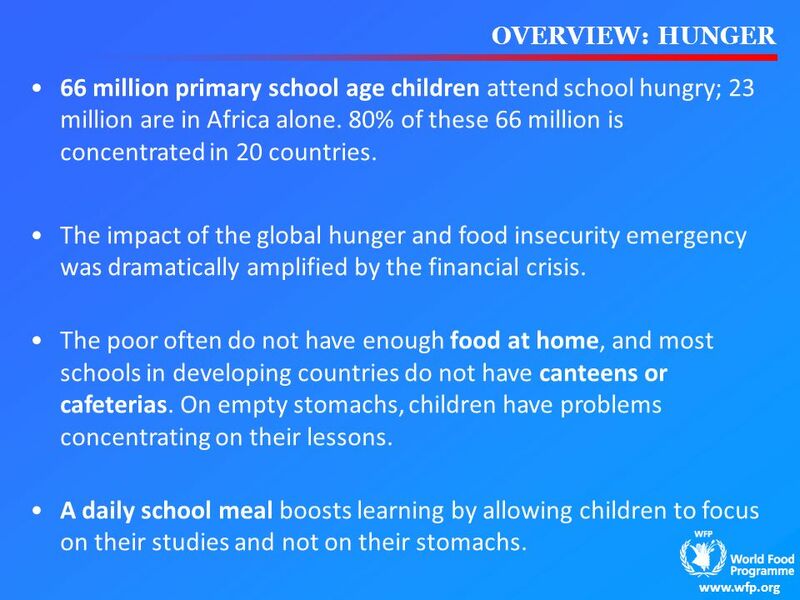 3 OVERVIEW: HUNGER 66 million primary school age children attend school hungry; 23 million are in Africa alone. 80% of these 66 million is concentrated in 20 countries. The impact of the global hunger and food insecurity emergency was dramatically amplified by the financial crisis. The poor often do not have enough food at home, and most schools in developing countries do not have canteens or cafeterias. On empty stomachs, children have problems concentrating on their lessons. 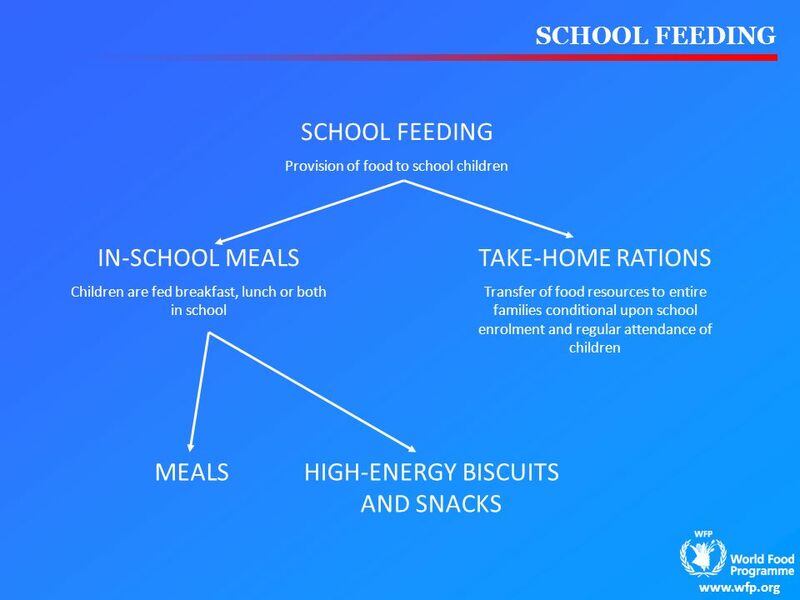 A daily school meal boosts learning by allowing children to focus on their studies and not on their stomachs. 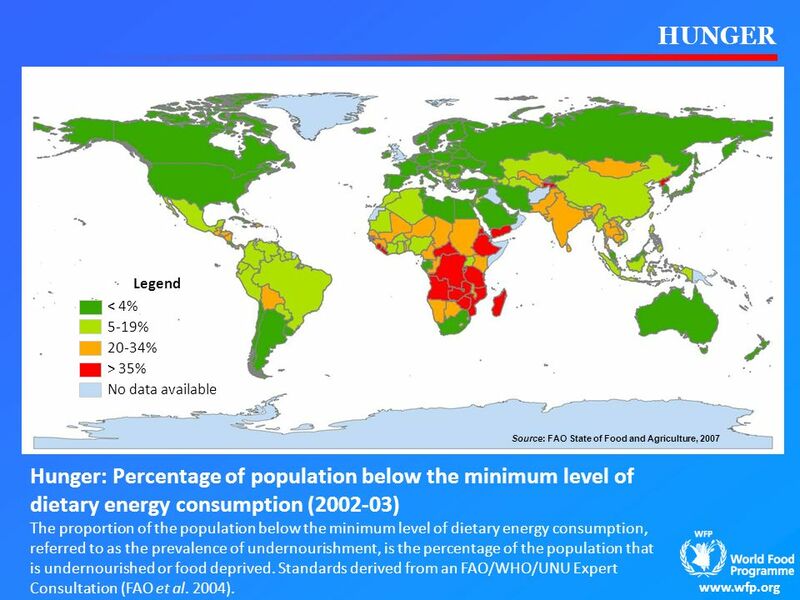 4 HUNGER Legend < 4% 5-19% 20-34% > 35% No data available Source: FAO State of Food and Agriculture, 2007 Hunger: Percentage of population below the minimum level of dietary energy consumption ( ) The proportion of the population below the minimum level of dietary energy consumption, referred to as the prevalence of undernourishment, is the percentage of the population that is undernourished or food deprived. 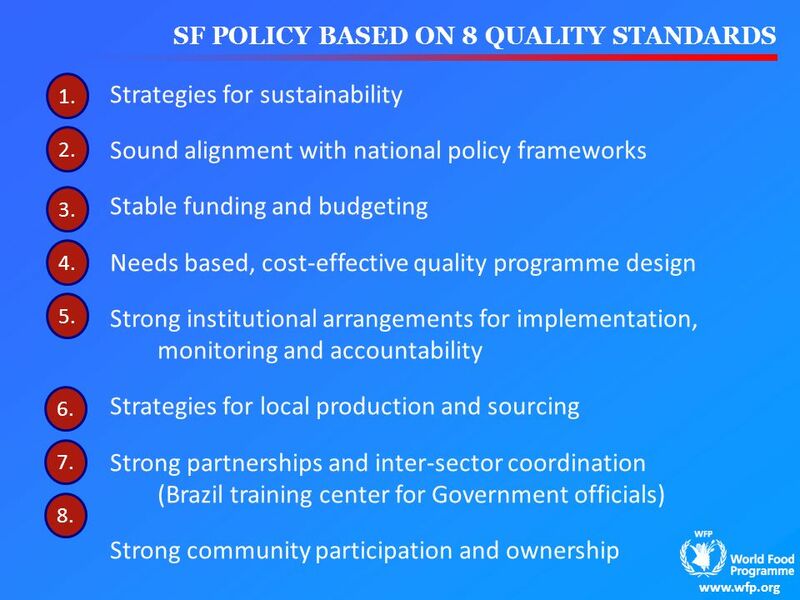 Standards derived from an FAO/WHO/UNU Expert Consultation (FAO et al. 2004). Legend < 4% 5-19% 20-34% > 35% No data available Source: UNESCO Institute for Statistics in EdStats, 2008 Primary school completion rate, total ( ) 75 million school-age children (55% of them girls) do not attend school; 47% of them live in sub-Saharan Africa. 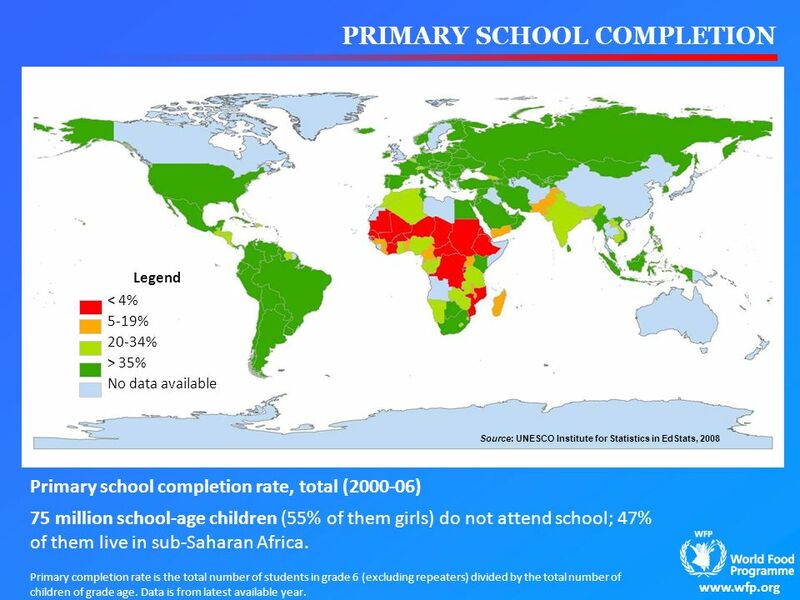 Primary completion rate is the total number of students in grade 6 (excluding repeaters) divided by the total number of children of grade age. Data is from latest available year. Legend Category 1 Category 2 Category 3 No data available Sources: School feeding: Country programs ( ) Category 1: Countries where school feeding is available in most schools, sometimes or always with subsidies for some or all children; Category 2: Countries where school feeding is available in most schools some of the time; Category 3: Countries where school feeding is available primarily in the most food insecure regions. 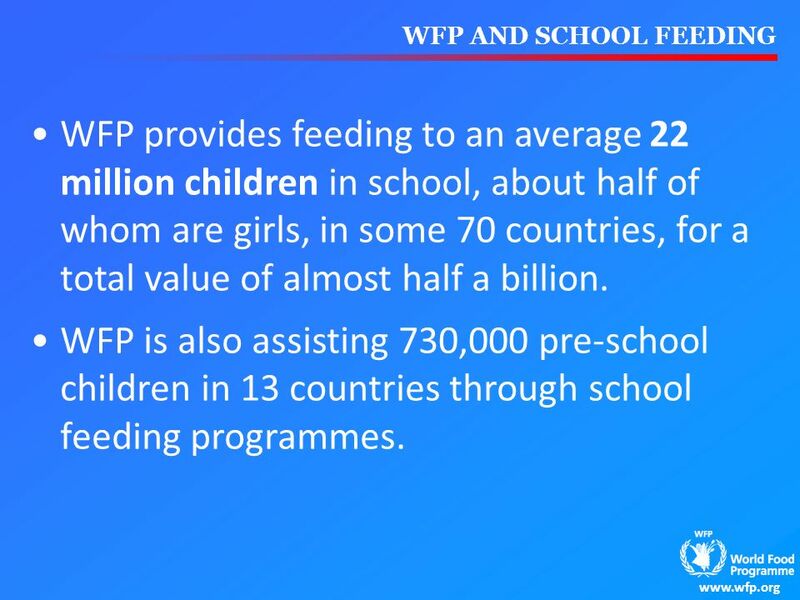 8 WFP AND SCHOOL FEEDING WFP provides feeding to an average 22 million children in school, about half of whom are girls, in some 70 countries, for a total value of almost half a billion. 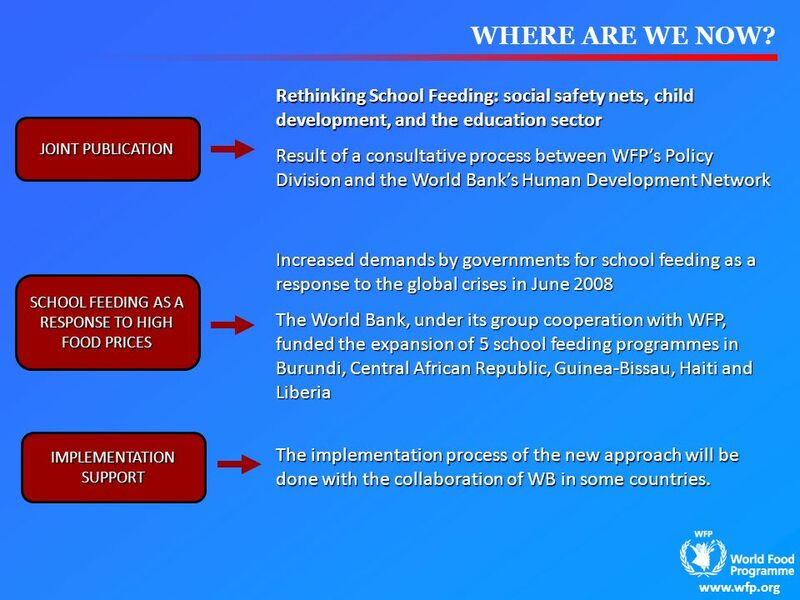 WFP is also assisting 730,000 pre-school children in 13 countries through school feeding programmes. SCHOOL FEEDING OUTCOMES Nutrition Improved micronutrient and macronutrient intake lead to enhanced nutrition and child health, increased learning and decreased morbidity for students Education School feeding can help to get children into school and help to keep them there, through enhancing enrolment and reducing absenteeism. 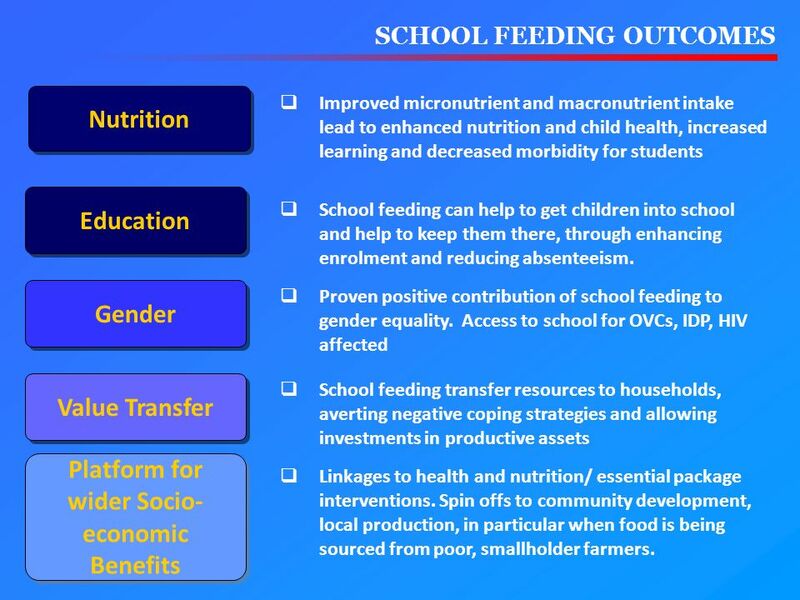 Gender Proven positive contribution of school feeding to gender equality. Access to school for OVCs, IDP, HIV affected Value Transfer School feeding transfer resources to households, averting negative coping strategies and allowing investments in productive assets SEE ALSO THE BACKUP SLIDES FOR SOME EVIDENCE School Feeding Programmes in place around the world today have demonstrated five main outcomes. 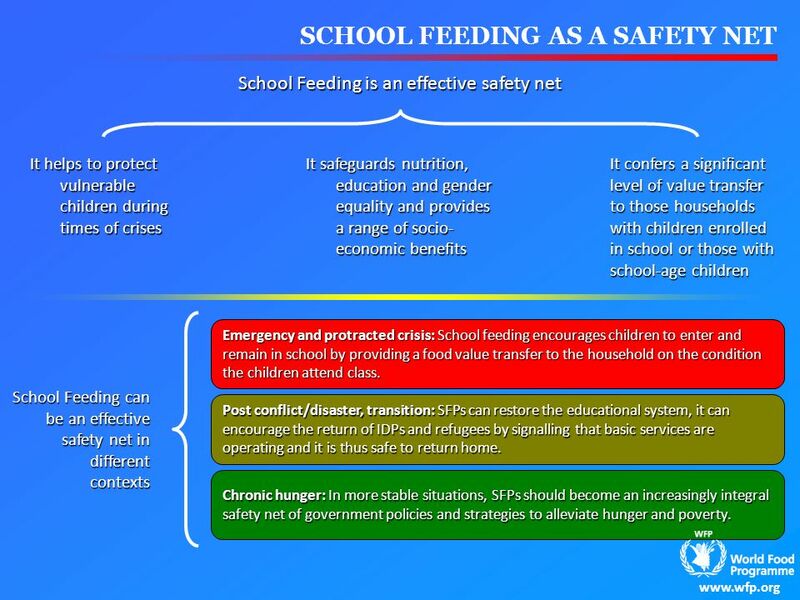 Safety nets: school feeding can transfer about 11% of household expenditure to households for each child who participates. That is quite high considering that the average cash transfer programme transfers around 15%-20%. 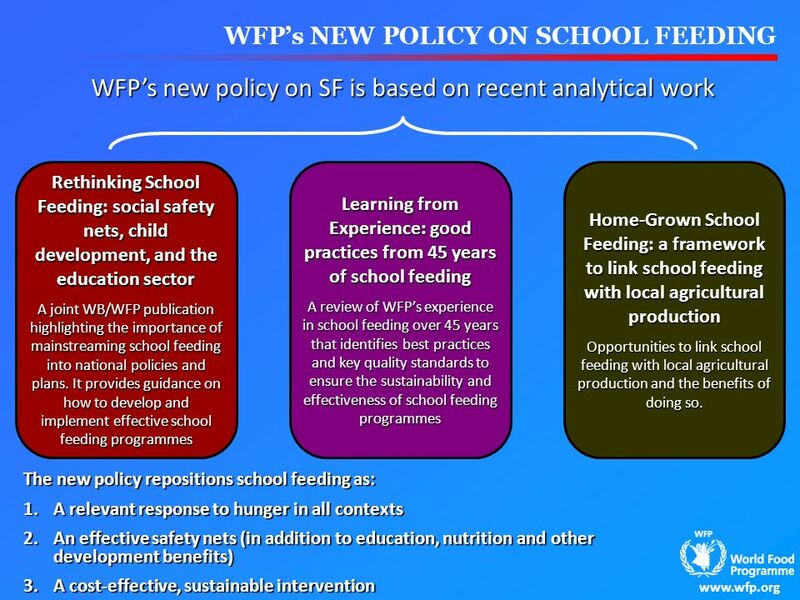 This is a new policy focus for WFP and is referred to later in the presentation. Education: SF is an intervention that has proven educational benefits, both on improving school participation and cognitive abilities. It can have a major impact on enrolment, attendance, learning and cognitive development. Nutrition: There are clear nutritional benefits for schoolchildren of providing foods which have been fortified with micronutrients. Programmatic evidence suggests that de-worming through schools is safe, cheap and remarkably cost-effective. 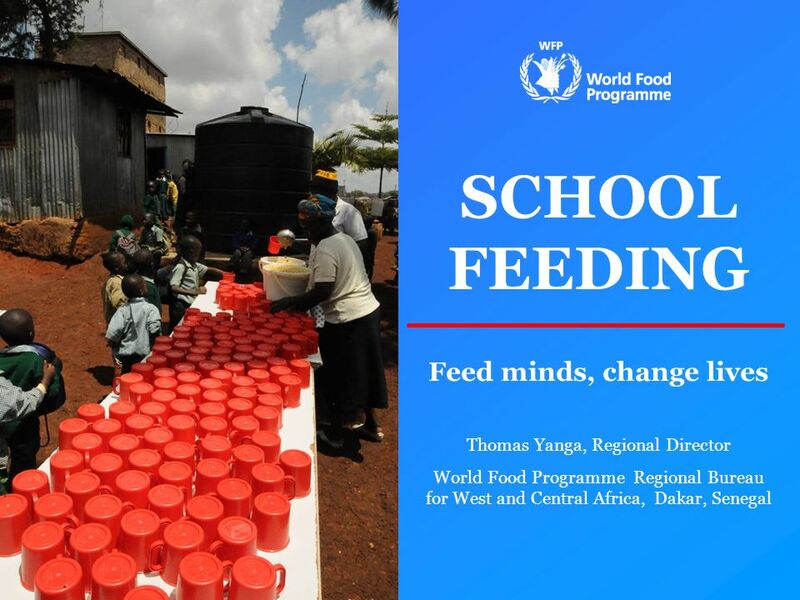 School feeding in many cases presents the vehicle or channel for delivery. Equitable access: Evidence shows that school feeding has a particular strong effect on enhancing school participation among girls. Also, in areas with high HIV prevalence, emerging evidence shows that school feeding has the potential of enhancing enrolment, attendance and progression of orphans and other vulnerable children. 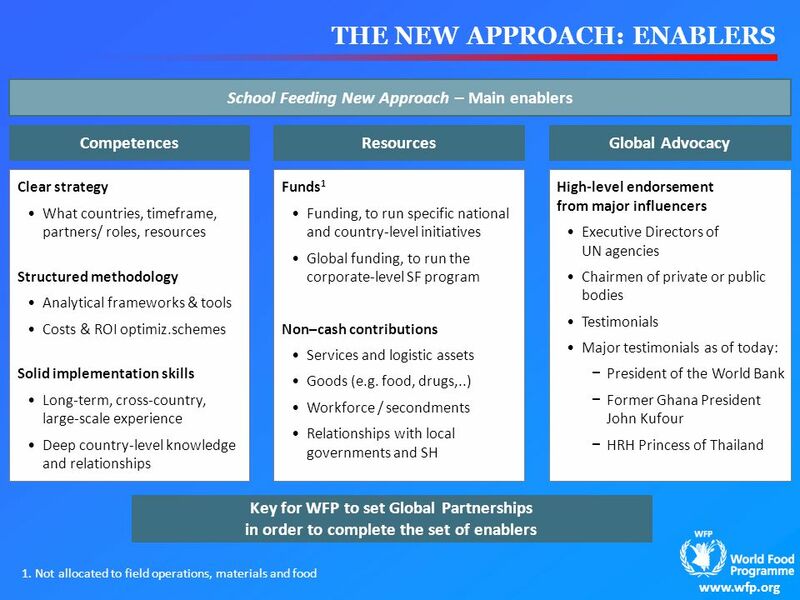 Local development: local purchase for school feeding becomes a win-win situation for the children and for local farmers and local economies. Community self-reliance can be strengthened through a programme which is locally-driven and planned. 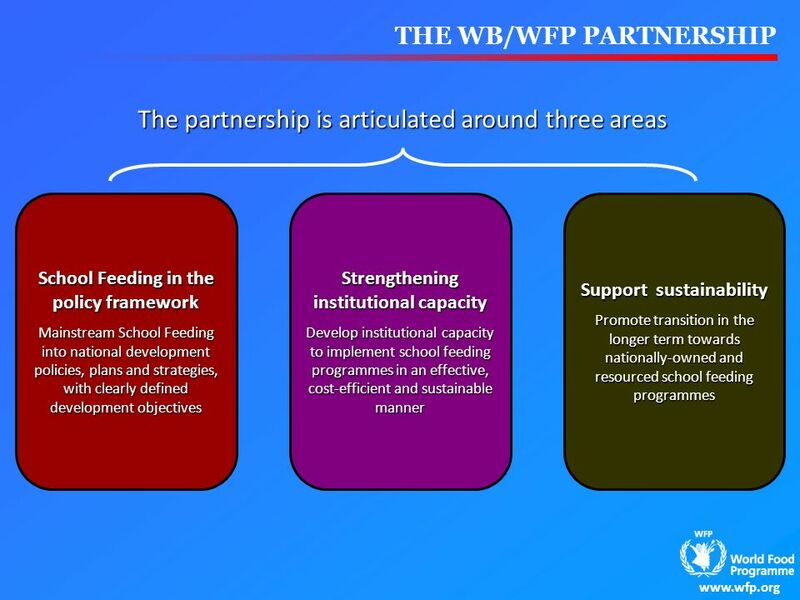 This is a new strategic focus for WFP and is referred to later in the presentation. 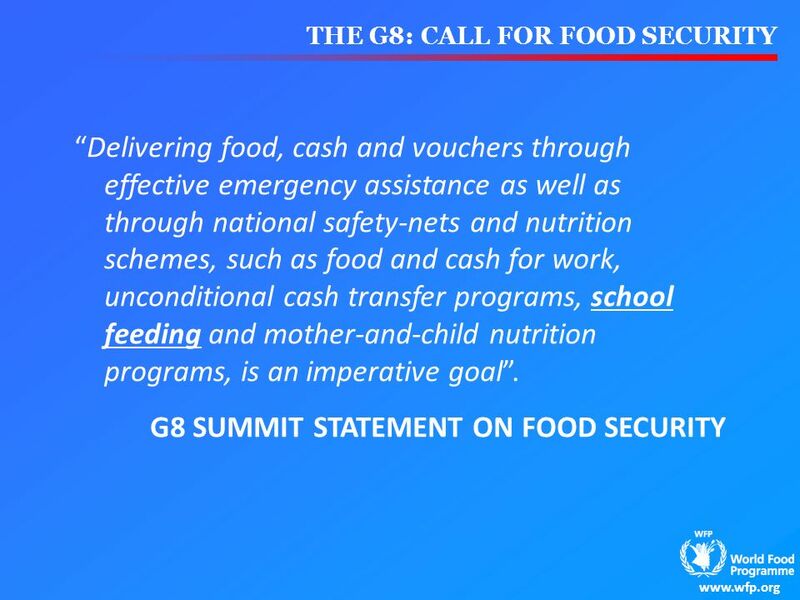 Platform for wider Socio-economic Benefits Linkages to health and nutrition/ essential package interventions. Spin offs to community development, local production, in particular when food is being sourced from poor, smallholder farmers. 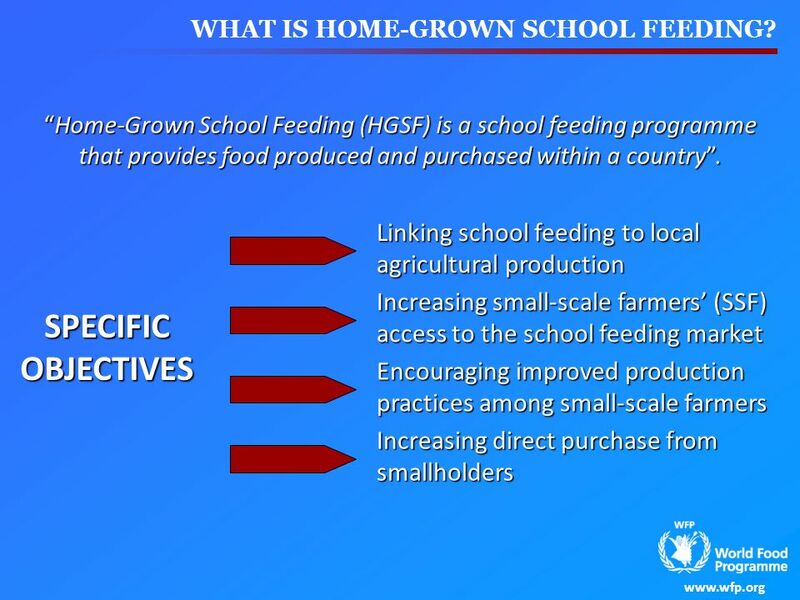 12 WHAT IS HOME-GROWN SCHOOL FEEDING? Aim to increase access for small-scale farmers through activities in three focus areas: STRATEGIC PROCUREMENT AGRICULTURAL DEVELOPMENT INSTITUTIONAL DEVELOPMENT Removing the barriers that small-scale farmers might face in accessing the school feeding market, such as: Lack of information Insufficient capacity to meet traditional tendering requirements Lack of capacity to supply, store and transport commodities Vulnerability to post-harvest losses Tailoring assistance packages (e.g. improved seeds, fertilizers and other agricultural inputs at subsidized prices) to the least advantaged small-scale farmers to help them: Increase productivity Produce better-quality crops Manage natural resources Mitigate risks in a sustainable way In line with CAADP pillar III and NEPAD plans Contextual support that exists and may need to be developed for the appropriate design and implementation of HGSF. 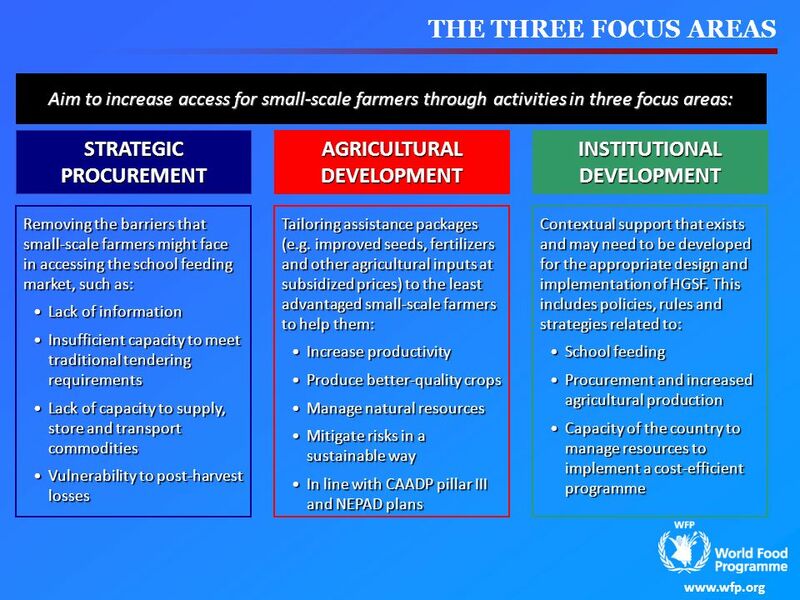 This includes policies, rules and strategies related to: School feeding Procurement and increased agricultural production Capacity of the country to manage resources to implement a cost-efficient programme Strategic procurement: the purchasing process that supplies food to the school feeding programme in such a way that small-scale farmers benefit by ensuring that the procurement process is “strategic”. This means removing the barriers that small-scale farmers face in accessing the school feeding market, such as lack of information, insufficient capacity to meet traditional tendering requirements, lack of capacity to supply, store and transport commodities and vulnerability to post-harvest losses. Agricultural development: activities intended to help small-scale farmers increase productivity, produce better-quality crops, manage natural resources and mitigate risks in a sustainable way. This entails the provision of assistance packages (e.g. improved seeds, fertilizer and other agricultural inputs at subsidized prices) to the least advantaged small-scale farmers so they can produce food in greater quantities and be able to supply the school feeding programme. Institutional development: support for appropriate design and implementation of the HGSF programme. 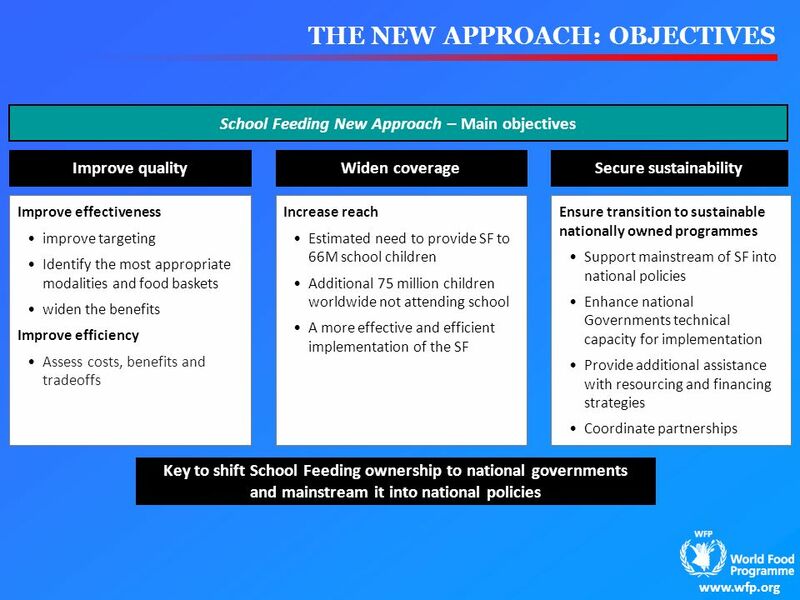 This includes the policies, standards, rules and strategies related to school feeding, procurement and increased agricultural production and to national capacity building to fund, manage and implement a cost-efficient programme and document results. SCHOOL FEEDING AS A SAFETY NET School Feeding is an effective safety net It helps to protect vulnerable children during times of crises It safeguards nutrition, education and gender equality and provides a range of socio-economic benefits It confers a significant level of value transfer to those households with children enrolled in school or those with school-age children Emergency and protracted crisis: School feeding encourages children to enter and remain in school by providing a food value transfer to the household on the condition the children attend class. 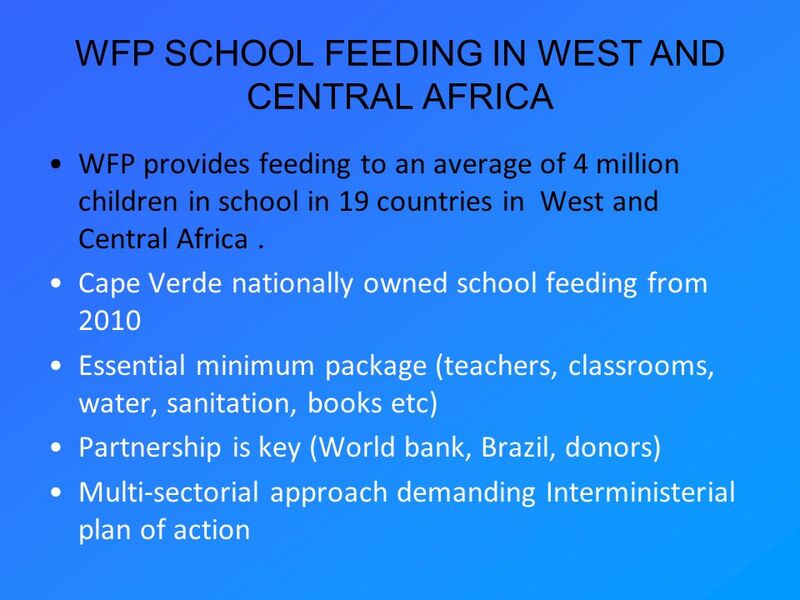 School Feeding can be an effective safety net in different contexts Post conflict/disaster, transition: SFPs can restore the educational system, it can encourage the return of IDPs and refugees by signalling that basic services are operating and it is thus safe to return home. Chronic hunger: In more stable situations, SFPs should become an increasingly integral safety net of government policies and strategies to alleviate hunger and poverty. 20 WHERE ARE WE NOW? Rethinking School Feeding: social safety nets, child development, and the education sector Result of a consultative process between WFP’s Policy Division and the World Bank’s Human Development Network JOINT PUBLICATION Increased demands by governments for school feeding as a response to the global crises in June 2008 The World Bank, under its group cooperation with WFP, funded the expansion of 5 school feeding programmes in Burundi, Central African Republic, Guinea-Bissau, Haiti and Liberia SCHOOL FEEDING AS A RESPONSE TO HIGH FOOD PRICES IMPLEMENTATION SUPPORT The implementation process of the new approach will be done with the collaboration of WB in some countries. 22 With US$50 a child can be fed for an entire school year. THE NEED Just US$0.25 will fill a cup with porridge, rice or beans and give a monthly ration to take home. With US$50 a child can be fed for an entire school year. 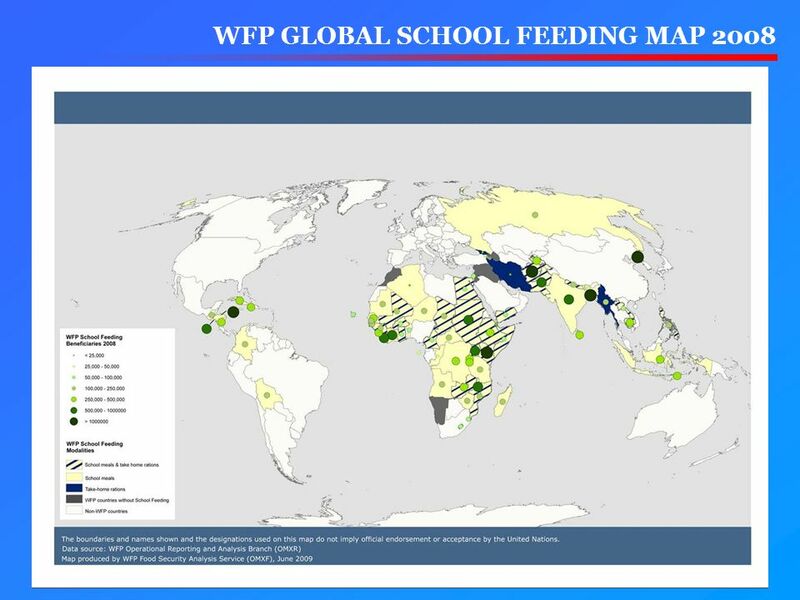 WFP calculates that US$3.2 billion is needed per year to reach all hungry school age children. 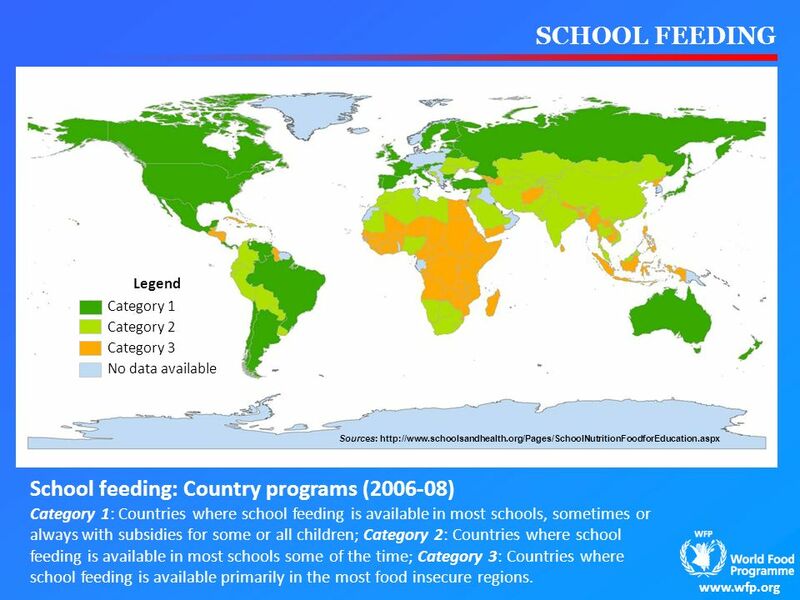 There are 66 million hungry school age children in the world. 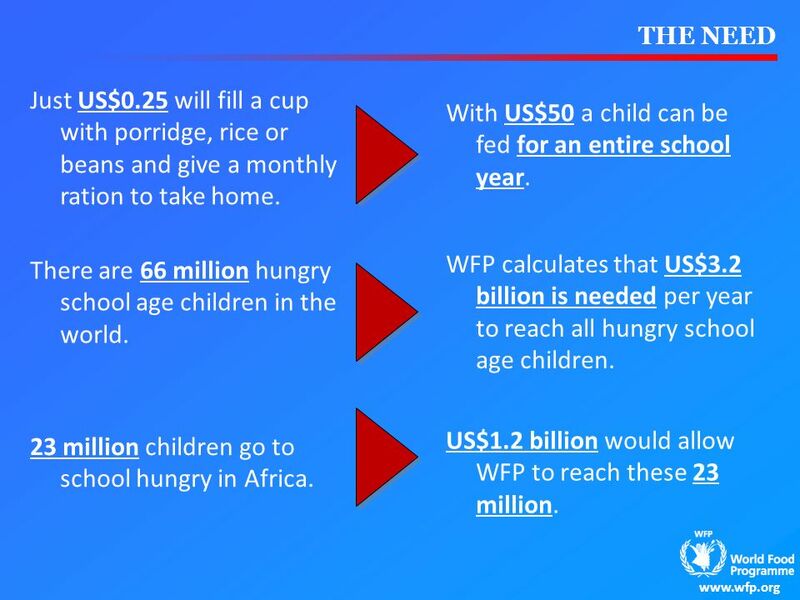 US$1.2 billion would allow WFP to reach these 23 million. 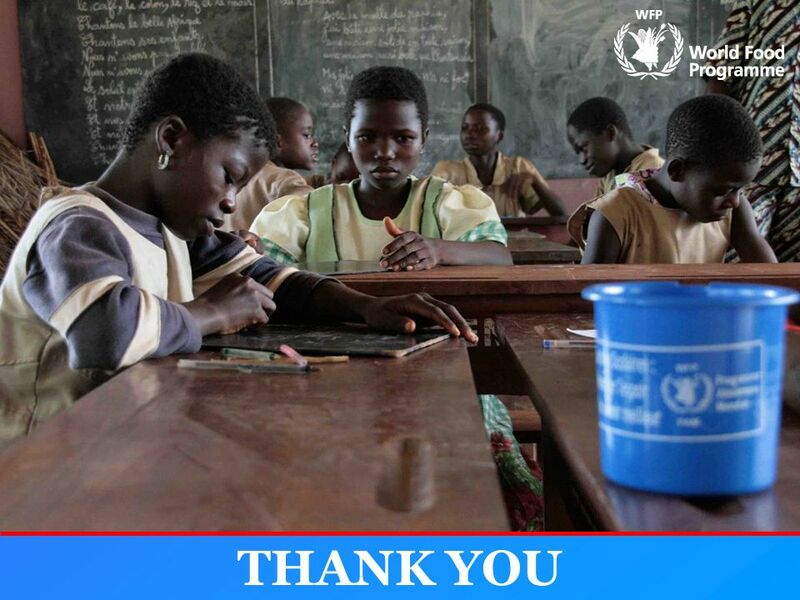 23 million children go to school hungry in Africa. 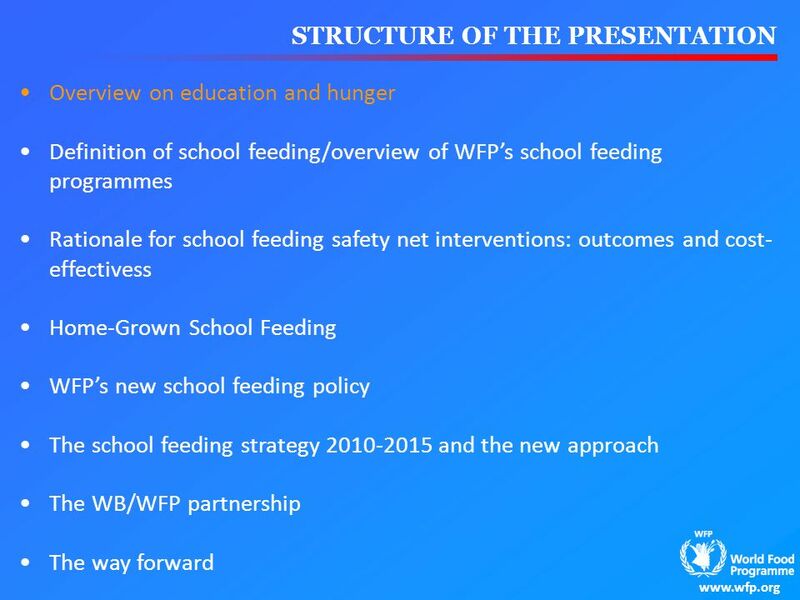 Download ppt "Feed minds, change lives"
Comprehensive Review of National Development Strategies Lesotho. Mainstreaming Disability in Development Cooperation: experience, vision and future Charlotte McClain-Nhlapo The World Bank 47 th Session of the Commission. International Labour Office 1 Expert Group Meeting Policies to advance Social Integration New York, 2-4 November 2009 Griet Cattaert – Michael Cichon Social. Community Based Care for children affected by HIV and AIDS 9 th ICAAP – Bali August 2009 Carol KIDU DBE MP Minister For Community Development Papua New. DISABLING BARRIERS – BREAK TO INCLUDE WORLD REPORT ON DISABILITY. Economic and Social Development Department The State of Food Insecurity in the World Food and Agriculture Organization of the United Nations The State. Lindiwe Majele Sibanda Overview of FANRPAN 20 June 2008 Kempton Park, South Africa FANRPAN Board and Partners Meeting.